There are a variety of resources available through SERC websites aimed at the two-year college teacher community. 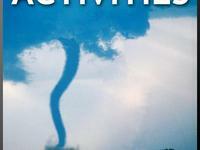 Several groups have developed extensive collections of teaching activities at various educational levels. 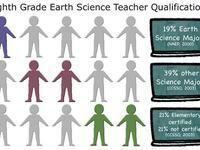 There are also opportunities for professional development available to teachers who teach Earth science. 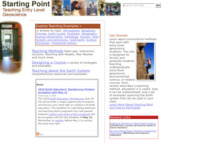 Starting Point: Teaching Entry Level Geoscience - This site is designed for faculty and graduate students teaching undergraduate entry-level geoscience, environmental science, or related courses. Each section describes a teaching method, why/when it is useful, how it can be implemented, and a set of examples spanning the Earth system that can be used in your class. Geoscience in Two-Year Colleges - This project provides information and materials specifically aimed at teaching geoscience at two-year colleges around the country. The website includes information about the importance of two-year colleges, teaching resources, explores workforce development, provides faculty career descriptions, and hosts a discussion board and email list. 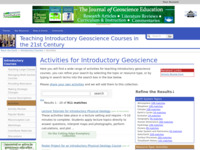 Introductory Level Geoscience Activity Collection - From the Cutting Edge project, browse over 400 classroom and lab activities aimed at intro-level geoscience audiences. Introductory Level Geoscience Course Collection - From the Cutting Edge project, an extensive collection of introductory-level geoscience courses, spanning a host of geoscience topics. 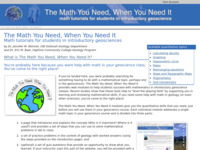 Math You Need - These modules cover quantitative topics that are important in introductory geoscience courses. Each topic includes a page for the instructor, quantitative information for the students, a set of practice problems and culminates in an on-line quiz that is automatically graded and submitted to the instructor. The project is designed to give students the quantitative knowledge that they need, just before they need to use it in their concurrent geoscience course. 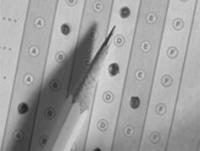 This program includes pre- and post-testing and self-paced modules. 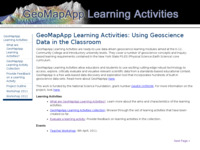 GeoMapApp Learning Activities: Using Geoscience Data in the Classroom - Ready-to-use, data-driven geoscience learning modules aimed at the K-12, community college and introductory university levels, these activities allow students to access, explore, and visualize geoscience data using the GeoMapApp data discovery and exploration tool. Teaching Climate and Energy Science These pages provide a guide for educators about teaching climate literacy and energy literacy from the Climate Literacy and Energy Awareness Network (CLEAN). They include summaries of principles, possible challenges for educators, suggested pedagogical approaches for each grade level, a collection of reviewed teaching activities. 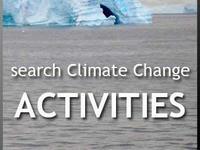 This hand-picked collection of scientifically and pedagogically reviewed teaching activities, visualizations, and lab activities involving climate science, climate change, and energy awareness includes materials for middle and high school students as well as undergraduate classrooms. 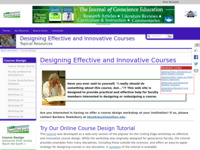 Designing Effective and Innovative Courses - This web site is designed to provide practical and effective help for faculty members interested in designing or redesigning a course. The materials found here include an online course design tutorial, descriptions of course design workshops, course goals and syllabus database, and links to past course design workshops. 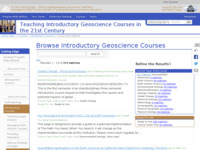 Teaching Geoscience Online - These pages are designed to help geoscience faculty improve their online teaching, or to provide guidance to those who are considering venturing into the online classroom. These materials were authored by participants in the 2010 Cutting Edge workshop, Teaching Geosciences Online. Workshop outcomes can be viewed on the program page and in the workshop report. 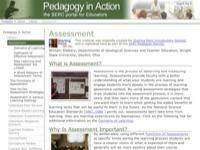 Assessment - This material describes what assessment is, why it is important, how to use an assortment of assessment strategies, and it provides examples of assessment in various settings. Further topics that can be found on these pages include the domains of learning, hallmarks of effective assessment, how learning and assessment are linked, and a glossary of terms. Two-Year College Resources: Supporting and Advancing Geoscience Education at Two-Year Colleges (SAGE 2YC) - SAGE 2YC presents information focused on the preparation of students in two-year colleges for the geotechnical workforce and transfer to four-year programs as geoscience majors. Materials include information on geoscience careers, workforce preparation programs and career resources available from professional societies as well as details about past and future workshops. National Association of Geoscience Teachers - A professional society for earth science educators at all levels. There is a 2-year college division for NAGT members who have a shared professional interest in geoscience education at two-year colleges. The organization also maintains robust regional sections where educators gather to share ideas and teaching materials. A number of award and professional development programs are open to educators. 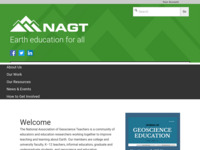 NAGT also publishes the Journal of Geoscience Education, one of the premier publications in geoscience education as well as In the Trenches, a quarterly print and digital publication. 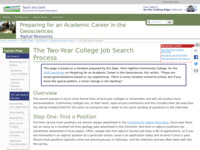 Two-Year College Job Search Process - Part of the Cutting Edge Career Prep project, this web page provides insight and tips for applying for a two-year college faculty position. Tips for the 2YC interview process are also available. Preparing Teachers to Teach Earth Science - This site examines the role of geoscience departments and faculty in preparing pre-service teachers and supporting practicing teachers who teach Earth science at all pre-college levels. Information is drawn from the participants and outcomes of the 2003 On the Cutting Edge workshop, Developing the Earth Science Teacher Workforce: The Role of Geoscience Departments and Introductory Courses. 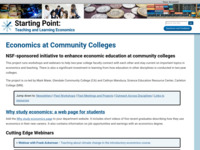 Economics at Community Colleges - This site provides resources related to teaching economics at two-year colleges, including recordings of professional development webinars, newsletter archives, and links to outreach across disciplines. Resources for Teaching Introductory Level Courses - This Site Guide provides pointers that contain useful information and inspiration for teaching introductory-level courses. While many of these resources are geared towards the geoscience community, they can be modified to fit other science disciplines. 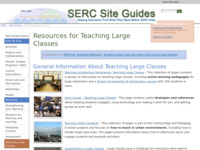 Teaching Large Classes - This Site Guide provides resources that are useful in designing and teaching large courses. 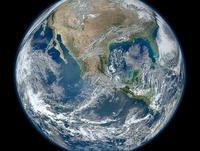 Climate Change and Global Warming - This Site Guide will show you where to find teaching resources about climate change and global warming from SERC projects and collaborators. 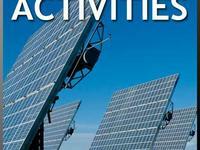 Energy - This Site Guide will show you where to find teaching resources about energy from SERC projects and collaborators. 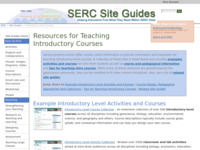 Biology - This Site Guide will show you where to find teaching resources about biology from SERC projects and collaborators. 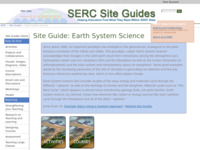 Earth Systems Science - This Site Guide will show you where to find teaching resources about Earth systems science from SERC projects and collaborators. 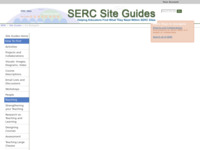 Hazards - This Site Guide will show you where to find teaching resources about hazards from SERC projects and collaborators. 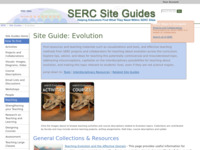 Evolution - This Site Guide will show you where to find teaching resources about evolution from SERC projects and collaborators. 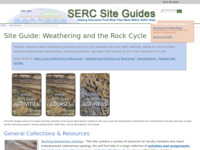 Weathering and the Rock Cycle - This Site Guide will show you where to find teaching resources about weathering and the rock cycle from SERC projects and collaborators.